How Can I Go Another Look Hair Salon? 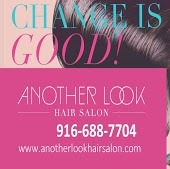 Where is Another Look Hair Salon in Sacramento on the Map? Few months ago I went in to Tracy with brown roots and several shade of blonde along with bleach bleeds along my touch -ups which gave my hair the look of lines throughout. Tracy spent close to 4 hours doing a color correction and gave me beautiful blonde evened out hair. I was so happy and relieved for the first time in years. It is so difficult to find a hairdressers you can trust to keep the integrity of your hair and give you the beautiful color you want! Plus she was patient enough to deal with my nervousness! Service,Talent, & Customer Service is Second to NONE! I have been a client for over a decade and my experience has always been pleasant. I remain a loyal client to Tracy Brown (owner) because she is simply "The Best". Professional, trendy and healthy hair... My teen daughter and I are both clients of Another Look Salon. We moved from the Vacaville area 6 years ago and prior to finding Another Look Salon we searched the Sacramento area for over a year trying to find a professional hair care place for black hair. Unimpressed and after trial and error I just couldn't find a suitable place to meet our hair care needs, so I traveled to Vacaville every Thursday for a year. Finally, I found Tracy Brown and have been a client of hers for almost 5 years. Tracy continues to be cutting edge w the lastest trends while keeping our hair healthy. No matter where I am and on any given day, women of all races compliment my hair and how healthy it is. Another Look is my sanctuary and I look forward to my weekly appointments on Thursday. After driving to the bay area every two weeks to get my hair done for a year, I finally came across a woman who had gorgeous healthy looking hair. I began going to Another Look Hair Salon 7 years ago seeing owner Tracy Brown as my stylist. She immediately began educating me about my hair, something I never received from my previous stylist of 5+ years. After a few years of going to Tracy faithfully every two weeks for wash and flat iron I decided to get my first sew in weave. OMG my hair grew so fast after having the weave in for just three months! It looked so natural and the hair she uses requires little maintenance. I will continue to come to Tracy for my hair care needs and will follow her wherever she goes! This salon is a notch above the rest, the professionalism and attention to hair detail is to be respected.Tracy is absolutely the best trained stylist in northern california.